Jamila Salimpour began her performing career at the age of sixteen, in Ringling Brothers Circus as an acrobatic dancer. 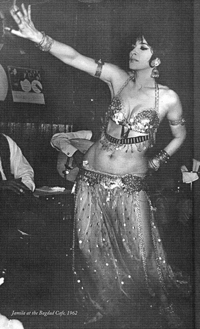 She studied Middle eastern music and dance, and in 1947 began appearing at cultural events and ethnic clubs in Los Angeles, and later in San Francisco, where she owned the Baghdad Cabaret. She began teaching in 1952, developing a unique method of verbal breakdown and terminology for her movements. She has trained innumerable teachers and performers from all over the world, and produced week-long seminars and festivals, often co-teaching with her daughter, Suhaila Salimpour. In 1969, she created the tribal Bal Anat, performing and touring with the forty member troupe. Jamila Salimpour’s complex finger cymbal patterns were published in a Finger Symbol Manual. She also published a history of middle eastern dance, From Cave to Cabaret, as well as a photographic collection of Middle Eastern dancers at the Chicago World Faire, and the Dance Format Manual. From 1974 to 1990, Ms. Salimpour was the Contributing Editor for HABIBI, a major Middle eastern dance periodical. 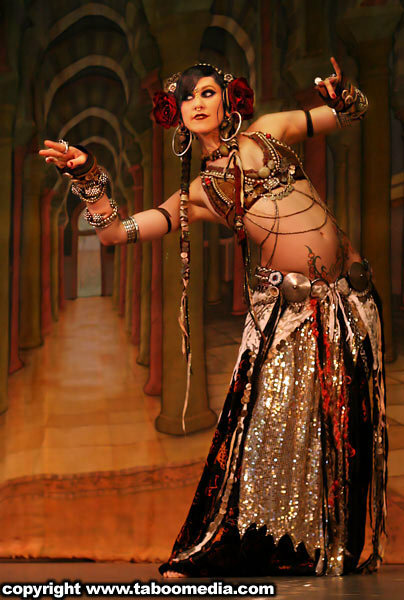 Director and founder of FatChanceBellyDance, has been dancing for over 30 years. In 1987 she created the concept of American Tribal Style Bellydance (ATS), a performance art form using a foundation of Middle Eastern "bellydance" yet stylized and adapted for a contemporary American audience. It is a blend of cultural dance influences from India, Spain, North Africa and beyond. Carolena has developed a method of improvisational choreography, using a vocabulary of natural movements and cues allowing the dancers to communicate via gesture when dancing together. The effect is a vibrant thread drawing the audience into the tapestry. An American Council on Exercise certified personal trainer, Carolena incorporates the science of anatomy and fitness into her classes and workshops. Eleven DVDs (performance, instruction and documentary) were produced with the help of a series of grants from the California Arts Council. Author of "Belly Dance, a fun and fabulous way to get fit" for Barnes and Noble publishers. Most recently the Folkwear pattern company worked together with Carolena to produce a pattern and make-up booklet based on the Tribal Style costume made popular by Carolena and FatChanceBellyDance. At the FatChanceBellyDance Studio in the Mission District of San Francisco one can find weekly classes in ATS, a store providing instructional DVDs, music, books, costumes, jewelry, cosmetics and accessories and a Resource Center complete with archival videos, books and photographs from the FCBD "experience." For more information please visit www.fcbd.com. Jill Parker, international, award winning instructor, choreographer & director. 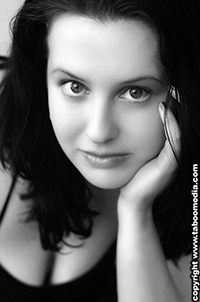 Jill is "the Mamma of the modern tribal fusion bellydance movement". She's an original member of legendary FatChanceBellyDance, founder/director of Ultra Gypsy, Djun Djun, Zambra!, and FOXGLOVE SWEETHEARTS. With over two decades of experience, she has trained many top dancers in the genre. Jill's big heart and deep love for her form shine through in her bustling classes and exquisite performances. She's an exceptional teacher with a knack for demystifying this sensuous and challenging dance, making its techniques accessible to new dancers, while offering tremendous insights for refinement to experienced dancers. MA, CMT, RYT has been a life-long dancer and performer, trained and proficient in many styles, including Salsa, West African, Modern, Jazz, Ballet, Hip Hop, 5-rhythms, Contact Improv, Gymnastics, and of course Tribal Fusion Belly Dance. She has been a 5+year core member, and co-choreographer with the ground-breaking, trend-setting Ultragypsy Bellydance Theater, until Fall, 2007, and a regular sub for Jill Parker’s classes, who is known by many as the founder of tribal fusion. Deb has also studied extensively from, and been creatively influenced by Rachel Brice and Mardi Love, as well as Zoe Jakes, Mira Betz, and Heather Stants. She also holds a level 1 certification from Suhaila Salimpour School of Dance. A sponge for learning, and a seeker of continually deepening her repetoire and relationship to the dance, Deb is well versed within the tribal fusion genre, having also studied with Kami Liddle, Frederique, Amy Sigil, FCBD, Cera Byer, and others. Currently, Deb teaches and performs nationally and internationally, offering her yogic approach and unique stylization of Tribal Fusion Bellydance. Most recently, she assisted Rachel Brice in her 5-day Tribal Massive intensive 2008, performed with Heather Stants and Urban Tribal at Tribal Fest 2008, and co-taught a retreat with Sharon Kihara in Hawaii, Dec. 08. She also produces SF Mecca Immersion, the first Tribal Fusion Belly Dance retreat/immersion event in the heart of the San Francisco. As a performer, Deb is honored to have collaborated and shared the stage with amazing artists such as: Balkan Beat Box, Beats Antique, Brass Menazerie Balkan Brass Band, EOTO, Vibesquad, Hamsa Lila, Goddess Alchemy Project, Lynx&Janover, UltraGypsy Bellydance Theater, members of the Yard Dogs Road Show, Urban Tribal Dance Company, Mira Betz, Gaudi, DJ DragonFly, Lucia Comnes Band, Knowa Knowones, ANA SIA, Rose Harden, Mystic Family Circus, Sofiah Thom, and more----in studios, speakeasies, theaters, and festivals throughout this hemisphere. A holistic health counselor, somatic educator, yoga teacher, and integrative bodyworker, Deb is also the founder of SattyaBodyHealingArts and Dance Collective. She teaches classes, workshops, and retreats fusing women’s health and empowerment with yoga, tribal belly dance, nature, and creative expression. Deb has taught at Kosmos world music and dance camp, at the Omega Institute in NY, at the Quest for Global Healing Conference, in Ubud, Bali, as well as other festivals and healing/sustainability conferences around the globe. She is a founding member of CAST (Creating a Societal Truth). As a massage therapist and yoga therapist for past 9 years, she specializes in injury rehab for dancers, and women’s health. Some of her Bellydance clients have included: Ansuya, Jill Parker, Sharon Kihara, Aubre Hill, Rose Harden, Sarah White, & Susan Frankowich. She is greatly influenced by her studies of Traditional Thai-Yoga Massage in the hill tribes of Northern Thailand under the lineage of Asokananda, her vision quest experiences in the Northern California Desert, and her Yoga teacher trainings and study with Integrative Yoga Therapy, Acroyoga, Darshana Weil, Shiva Rae, and Gary Kraftsow. She is currently working on a upcoming DVD of her unique dance therapeutics material. Deb has a B.A. in Pre-med and Psychology from Princeton University, and an M.A. in Holistic Health Education from JFK, with an emphasis on mind-body medicine and somatic psychology. You can find her writings published in Yoga Journal Magazine. Currently, she is continuing her Yoga studies in the Viniyoga Tradition with Gary Kraftsow and with Rachel Brice; immersing in her belly dance studies with Rachel Brice, Suhaila Salimpour, Zoe Jakes; and continuing to study modern, hip hop, folkloric, and contact improvisation dance forms in the vibrant dance community of the San Francisco Bay Area in which she lives. Zoe Jakes is a proud member of The Indigo. A long-time resident of the SF Bay area, she has been touring with Bellydance Superstars since the fall of 2005 and can be seen performing on their new Tribal Fusions DVD. Combining talents with David Satori and Tommy Cappel to create Tribal Derivations last spring, Zoe discovered she enjoyed creating music, and plans to make more. When not with the Indigo, she tours with The Yard Dogs Road Show, a cartoon circus sideshow of wacky dimension, and has been seen tearing it up with the Extra Action Marching Band. An innovative dancer, Zoe has been said to have her own unique take on Tribal Bellydance. She takes her influence from Art Nouveau, Tango, Breakdance, and Indian classical dance. Zoe was recently nominated for Zaghareet! Magazine's Best Interpretive Artist 2007. She loves unicorns and has never once doubted their existence. Peter Jaques (www.huzzam.com) has been a fixture of the Bay Area Near Eastern music scene since 1995. 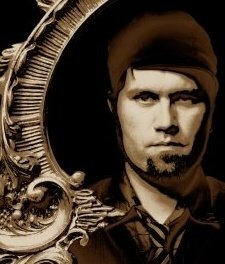 His style combines traditional Balkan Rom, Greek, Turkish, & klezmer styles with his own, deeply soulful approach. He performs principally on the Bb clarinet & trumpet, as well as alto saxophone, Egyptian nay (reed flute), & Turkish G clarinet. Peter directs the Brass Menažeri Balkan Brass Band, winner of the SF Weekly's Reader's Choice Award (2008) in the "Best International Band" category. Peter also performs with Rumen Sali Shopov's Orkestar Sali; former Kitka director Juliana Graffagna's Black Olive Babes; Stellamara, a Middle-eastern/Balkan/world fusion ensemble led by Sonja Drakulich; and Gamelan X, a hybrid processional gamelan orchestra based on traditional Balinese baleganjur. David Satori was born in Burlington Vermont, June 6th 1979. He started making music at the age of 12. Seeing his brother strum a couple of chords on the guitar got him hooked instantly. At 17 he released his first album, which was a double CD of original compositions composed by his high school garage band, Bubble Tribe. After high school David got accepted to California Institute of the Arts outside Los Angeles. He was exposed to a diverse range of sounds from around the globe. David immersed himself in as many traditions as he could handle, ranging from West African, North Indian, Middle Eastern, Indonesian, Western Classical and Modern Avant Gar-de music. David received his BA in Music Performance and Composition in 2001. Soon after Cal Arts he recorded and toured the West Coast with The Funnies, an instrumental, experimental quartet based in LA which put out two full length CD's between 2001 and 2003. The Funnies toured around the western states in an old shuttle bus which David owned. The band figured out some how to run the bus on recycled vegetable oil from restaurants. 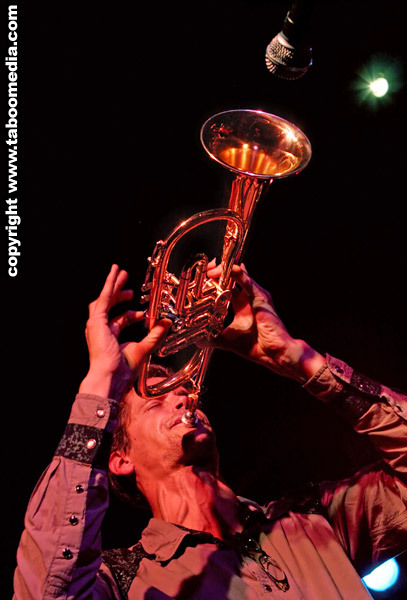 In 2003 David moved up to San Francisco and joined the 10 piece afrobeat ensemble Aphrodesia. He began writing music and touring with Aphrodesia all over the US. In 2004 Aphrodesia made a historic trip from San Francisco to New York in his bus driving on 100% recycled vegetable oil. Their destination was to join the protest for the Republican National Convention. This trip received national attention when USA Today featured the Bus and Aphrodesia on the cover of the USA Today’s Life Section. In 2006 the band made another historic trip to West Africa where the band toured through Ghana, Benin Togo and Nigeria. In Nigeria the band ended their tour by performing two nights with Femi Kuti at the New Afrika Shrine. David also promoted the use of Bio-Fiuels on this trip and made appearances on Ghana national TV speaking about the issues of alternative fuels. Aphrodesia has released four full length CD's. The latest album "Lagos by Bus" will be released this spring 2007. 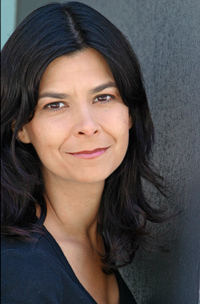 Dena Martinez is a professional actress that has toured nationally, with The San Francisco Mime Troupe, Culture Clash, and with the acclaimed El Teatro Campesino, where she was a company artist for four years. Ms Martinez has also starred in two children's television shows for PBS. Regional Theater credits include: The American Conservatory Theater, Theaterworks; Chavez Ravine with Culture Clash; Traveling Jewish Theater, Marin Theater Company; San Jose Stage ,Thick Description, Campo Santo, Teatro Vision, San Jose Rep, BRAVA Theater Center, Berkeley Rep,and the Magic Theater. She has worked with Shadowlight Theater Company creating with Balinese puppet masters. She is a writer and performer with The Cabbage Sellers of Hades, a musical dance piece with Elizabeth Strong, Mira Betz and Dan Cantrell. Dena was a featured teacher at 2008 SF Mecca Immersion in the advanced track, combining forces with Zoe Jakes to offer a theatricality for bellydancers workshop that was a highlight experience for many Mecca participants. We are excited to have her back again this year! Lee began honing her craft by working in diverse fields like glass, metal, mold-making, and stone, but found herself drawn toward her passion for collage and assemblage. Combining a performance history of theatre and dance compelled her interest in the construction of costuming, adornment, and props for stage and fire. 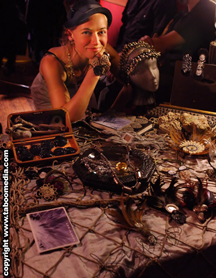 (Think Ultra Gypsy circa 1999-2006) The desire to repurpose materials led to the creation of FoolProof, her design studio and current culmination of artistry. "I like to think of our brains as “idea engines.” When I keep my hands busy -being engaged by the mind, the result navigates a picture of my creativity...I constantly pose the question: "What about this? "...I am inspired by the things I dream, specific experiences, the context of one thing in relation to another, and most especially~ the somewhat unnoticeable." Lee humorously thinks of herself as a Polish problem solver from the rustbelt of Ohio. The way she resource materials and the inspiration for constructing them, lends itself to the creation of unique, handmade wearable art. Pieces from the ONEOFFSKI collection have been dancing across stages in the U.S. on the likes of Ariellah, Rose Harden, Zoe Jakes, Sharon Kihara, Kami Liddle, The Nekyia, and Deb Rubin, while URCHINDISE has been known to be found internationally in the hands of Heather Stants, Jill Parker and other deluxe performers. FoolProof is blessed to be sought out by such talented women who insist on preserving and supporting the art of craft. Ariellah studied classical ballet with the Royal Academy of Dance of London for twelve years, beginning at age three. After a four-year break from dance that included two years in the Peace Corps on Africa's Ivory Coast, she returned to the United States eager to learn the dance of her Moroccan ancestry. For Rachel's bio, please visit www.rachelbrice.com. To view 2008 facilitators, click here.